I’m very pleased to be reviewing this metapuzzle by Mike Shenk; I hope to solve many more by him in the future. For those looking for Raul Ellaray and his frequent cosolver Sally J. Reese, be assured that they may return if the need arises. Can’t hold it back anymore — there’s our answer! 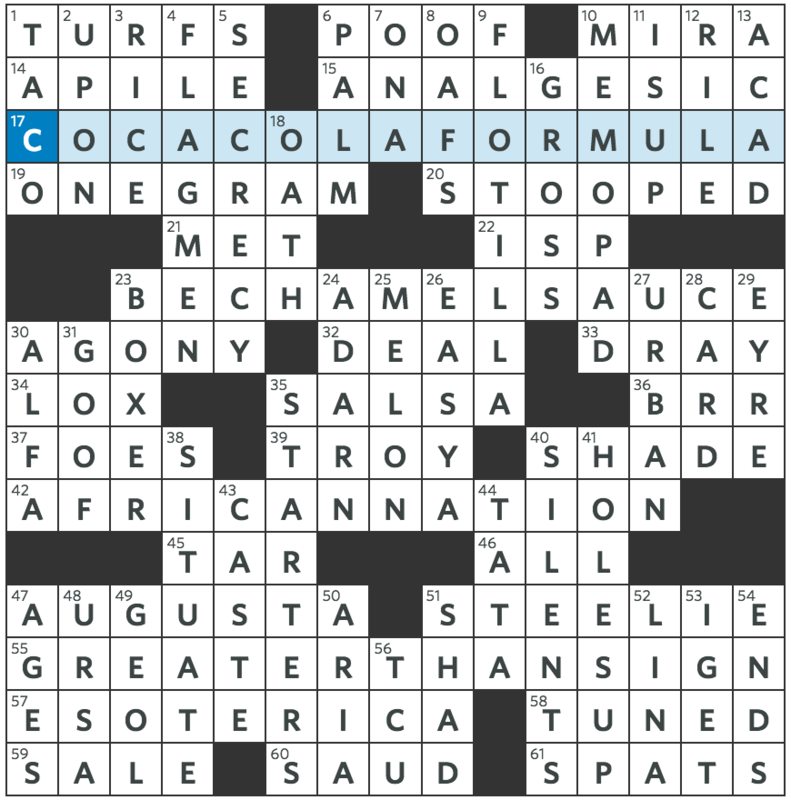 I’d give this 0.5 metaweeks on the Gaffney Scale — a nice, simple entry-level contest puzzle. Let the storm rage on! Wow — was I overcomplicating things. I thought that the word “character” had something to do with accent marks. Coca-Cola has a hyphen in it, Béchamel has an acute accent, the African nation could have been Côte d’Ivoire, and of course the greater than sign is >. Spent some time exploring that avenue and never got back to it see the forest for the trees. yep, followed that exact same path. I also have never seen Frozen, so I was DOA on this puzzle. I have a five-year-old and a two-year-old, so I don’t have your excuse. I like how each of the characters’ names has four characters. I haven’t seen a movie of any kind in over 20 years, just not my thing. That said, my neighbor did have an Olaf figurine on his lawn the past two Christmas seasons, and I learned it was from some movie called “Frozen”, but the chances of me making that association here were slim to none. I dunno, I suppose movies are fair game for a subject, but I wonder if there are a lot of other non-movie buffs out there. I haven’t seen Frozen, but I feel like the characters (and the song “Let It Go”) were pretty dominant in pop culture for a while. I’m actually impressed you managed to avoid the deluge! I only recognized ELSA at first, but from there it made sense that the game was to find four “characters,” making the names ANNA, HANS, and OLAF jump out. One of the easier ones from Mike, but I won’t complain since it was a nice relaxing meta compared to some Fridays when I’m tearing my hair out. 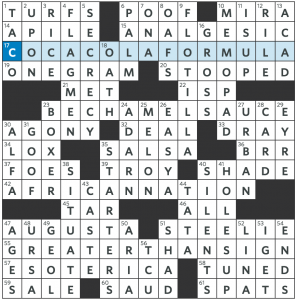 Plus, my fiancee who rarely does crosswords is strangely good at solving metas, so I’m always proud when I can figure one out without her help! Hidden answers crossing two-word phrases is no doubt the most straightforward contest approach, and there is only one step after that. So I could see why so many found this one incredibly easy or instantaneous. I got started on another wrong path. Bechamel is unusual, so I wondered what could justify its appearance, and I noted a resemblance to (Zoey) Deschanel. Another clue had a work kinda sorta close to (James) Caan. And they did appear together in a movie, only the other two theme entries refused to fit the pattern.